From Fort Henry to Corinth by Manning Ferguson Force is an available online nineteenth century resource for a narrative on the battle utilizing several maps to emphasize the importance of the strategic impact of capturing the fort is fully available on Google Books. Where the South Lost the War: An Analysis of the Fort Henry-Fort Donelson Campaign, February 1862 by Kendall D. Gott is another valuable book on the battle that can be previewed on Google Books. The Tennessee Encyclopedia of History and Culture provides an informative overview of the battle and has suggested readings for more information on the battle. The Library of Congress has a number of images and maps of the fort and surrounding areas. 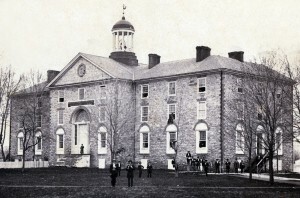 William Patrick Willey, Dickinson College Class of 1862, was determined to graduate even though all odds seemed to be against him. As a junior in college, Willey’s world erupted as his country went to war with itself after the battle of Fort Sumter on April 12, 1861. Ten days later Willey wrote his father, the future West Virginia senator Waitman T. Willey, of the precarious situation he was in as a Southern student in Carlisle, Pennsylvania. William sent two letters to his father within a one week period: one on April 22 and the second on April 29. Within this week William perceived that the situation in Carlisle had changed dramatically. 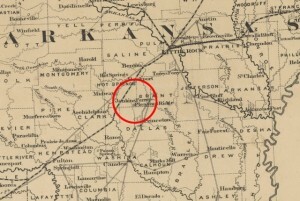 In his first letter, William described the excited mobs of townspeople at the train station: “women bidding adieu to their husbands and sons.” Though a committee from the town approached the college’s president, Dr. Herman Merills Johnson, informing him that Southern students must either leave or take an oath of allegiance, William told his father that he would try to stay as long as he could: “I fear nothing yet. The only ones that are in danger are the students from S.C.” One week later, William and his friend McCants were the only Southern students left. Now however, Carlisle residents complimented William on his dedication for remaining at school. More often, William wrote, he and McCants were approached for their opinion as Southerners because “in Carlisle the prominent desire seems to be that of getting a hold on Jeff Davis.” William’s two letters document the remarkable shift in emotions of Carlisle residents after the immediate shock of Fort Sumter wore off—by April 29th it appeared that the women of Carlisle no longer felt it necessary to arm themselves with broomsticks against a possible Southern attack. After graduating, William P. Willey went on to earn his law degree and became a law professor at West Virginia University, where he founded the West Virginia Law Review in 1894. Other Dickinson College students featured in Sellers’ album that fought in the conflict include fellow classmates Elbridge Hoffman Gerry, James Glasgow Archer, William Miller Ogilby and Ernest Dudley Martin. Sixteen-year-old John Taylor Cuddy left his home in Carlisle, Pennsylvania to enlist in Company A of the 36th Pennsylvania Infantry on June 5, 1861. 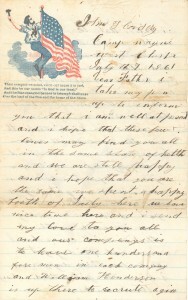 Over the next two years, Cuddy wrote 77 letters home to his family describing his experiences as a soldier in the Union army. Cuddy’s correspondence is available online as part of Dickinson College’s “Their Own Words” digital archive. 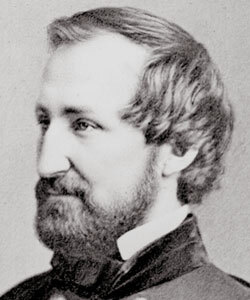 Over the course of his service in the army, Cuddy wrote his parents full of exuberance to go “lick the south” from his training camp at Fort Wayne, with a tempered tone of experience after fighting in the battle of Gaines’ Mill, and with a critical analysis of “old abe[‘s]” Emancipation Proclamation. At the Battle of the Wilderness, which lasted from May 5 to 7, 1864, Cuddy’s regiment was captured and sent to Andersonville, a Confederate prisoner of war camp in Georgia. With his capture, Cuddy’s letters stopped. Although John Taylor Cuddy never made it home to Pennsylvania (he died in a prison in Florence, South Carolina on September 29, 1864), his correspondence creates a living picture of the life of a teenage Pennsylvania soldier during the Civil War. 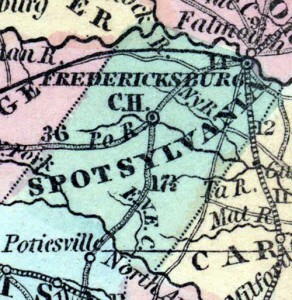 In its inaugural issue published on March 15, 1862 the New South, a weekly periodical with Northern sympathies, described the Union capture of Port Royal, South Carolina on November 7, 1861 as a “brisk little engagement with the enemy at Port Royal Ferry, in which the National forces, both Army and Navy manifested pluck and coolness the most desirable qualities in soldier’s or sailors.” This newspaper, which was highlighted in a previous post, documents life in occupied Port Royal through 1866 and is available online. As part of Union efforts to enforce the executive-mandated blockade on the South, Captain Samuel F. Du Pont, commander of the South Atlantic Blockading Squadron was sent to Port Royal, South Carolina where he helped capture Fort Walker and Fort Beauregard in the largest combined naval and military operation up to that point. 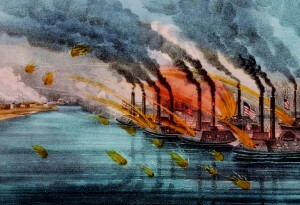 The Civil War Blockade Strategy Board met during the summer of 1861 created a series of reports that informed the Union’s naval blockading strategy including Du Pont’s attack on Port Royal. Matthew Parker made these reports fully available on “Thomas Legion” a website that organizes Civil War primary documents for easy research. 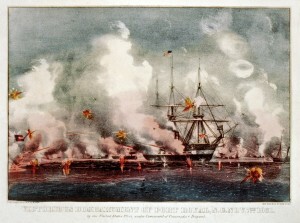 Other useful resources include the Library of Congress’s visual time line of the Civil War, which contains a collection of photographs from Port Royal, South Carolina from 1861 to 1865, a detailed essay on the battle of Port Royal, which appeared in the January 2001 issue of America’s Civil War. 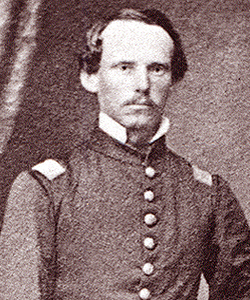 Confederates “forgot…the valor of Steele’s soldiers,” as another Union veteran explained. continue reading "Battle of Jenkins’ Ferry (April 30, 1864)"
The Battle of Ball’s Bluff, also known as the Battle of Harrison’s Island or Battle of Leesburg was fought on October 21, 1861 in Loudoun County, Virginia. In response to movement by Confederate Colonel Nathan G. Evans, Union Major General George B. McClellan ordered Brigadier General Charles P. Stone to conduct a “slight demonstration,” a show of force from the Maryland side of the Potomac River without the intention of having any troops cross or combat. After a small encounter with Confederate troops, Union soldiers were ordered to cross over the river into Virginia. 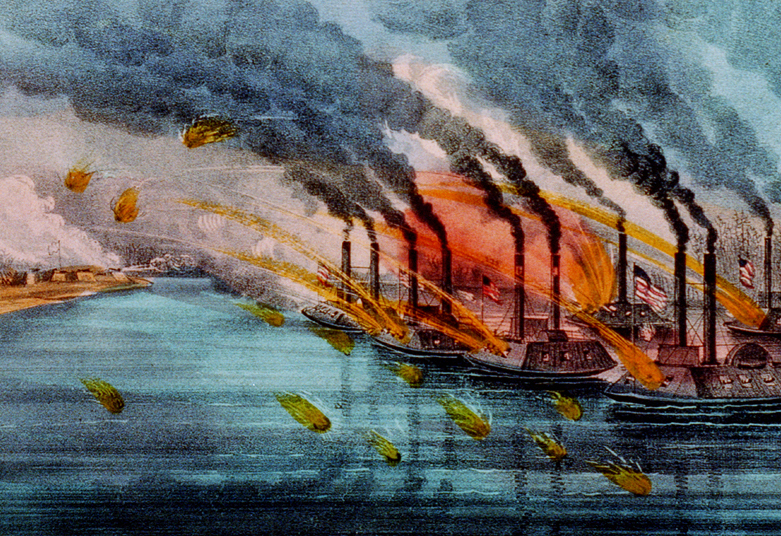 Without the necessarily amount of boats, Union soldiers were unable to successfully engage the enemy. This poorly coordinated attack combined with a vigorous counterattack from Confederate soldiers led to a disastrous defeat for the Union including the death of Colonel Edward D. Baker, a United States Senator from Oregon. Estimated casualties for the Union Army totaled over 900 while the Confederates suffered only 150. The defeat had substantial political consequences in Washington D.C. with the establishment of the Congressional Joint Committee on the Conduct of the War. Ted Ballard’s book Battle of Ball’s Bluff published by the U.S. Army Center of Military History provides the most extensive overview of the battle with a detailed account of the battle including maps, images, bibliographical sketches and further readings . 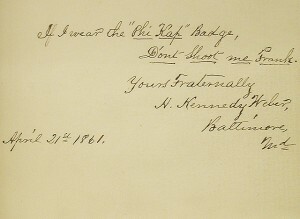 The Library of Congress offers a number of resources including images of Baker’s death and the Union retreat. 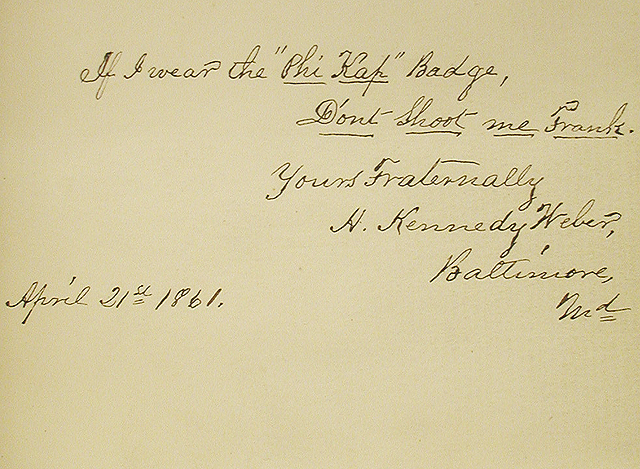 The Abraham Lincoln Papers at the Library of Congress is another valuable resource that contains transcribed military telegrams between generals and the President. The Ball’s Bluff Battlefield Regional Park and National Cemetery provides visitors a chance to explore the battle site with hiking trails and signs throughout the park. The Northern Virginia Regional Park Authority website also offers worthwhile information regarding the battle including an overview, cultural resources, a downloadable self guided audio tour and detailed battle maps.